This past Saturday was spent out in my yard. I wanted to finally pull all the vines off of my poor azalea bush by the side porch. Over the years, it has had its beautiful pink blossoms obscured by the green of the invading vines so often that whole portions of it seldom see the light of day. I start at the bottom near the stairs into the temple. I pull up several roots with twisted vines spiraling out in all directions. I climb up to begin cutting vines here and there knowing it will now be easier to pull out the other ends at the far side of the bush. I find my self following the vines down into the heart of the plant, weaving my fingers through branches and smashed blossoms hoping to avoid cutting living growth. But then we find some are so wedded to the azaleas, we cannot help but cut off the lost portions. Finally we are at the bottom of the plant. And now as we grasp at the roots and dig into the soil, we find that yes the bush itself must be pruned so we can get closer to the core. So we begin judiciously cutting just those that obscure our path. But soon, the pruning reaches higher as we clear a path to the source of the infestation. After a while, the last root is cleared. But my poor bush, it seems so open and vulnerable now that we can see its inner structure. “Now there can be new growth”, my compatriot reassures me. I nod in assent, but the sadness seeps out of my pores. Yes, there will be new growth, but till then she will look so small and brave. 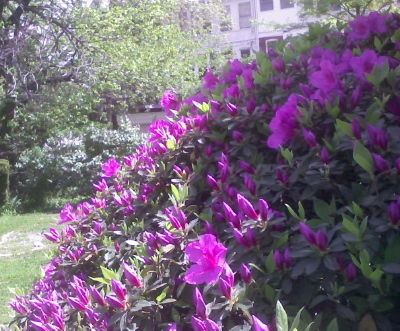 And if you think I am talking only about my azaleas, you have not been paying attention.